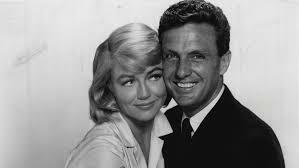 Far from flashy in comparison to the mighty Poseidon, this proved to be a first rate disaster flick for it’s era with the ever stoic Robert Stack doing his best to save his trapped wife, Dorothy Malone from going down with the ship when an ocean liner is all but lost at sea. As an aging ship makes it’s way across the open sea, the plot wastes little time in beginning it’s 91 minute running time of one man’s harrowing attempts at saving his wife. 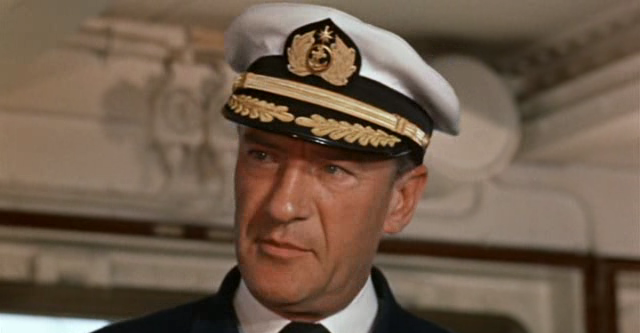 Following the opening credits, ship’s Captain, George Sanders receives a note that there’s a fire in the engine room. Meeting with Chief Engineer, Edmond O’Brien, Sanders believes it’s containable and that it had best be kept from the general population enjoying themselves on the ocean liner. Travelers like Stack and Malone who along with their young daughter are totally oblivious to the disaster that awaits them. Far below the decks in the ship’s hull, O’Brien and an impressive looking Woody Strode are struggling with a boiler system that has red lined and is sure to explode. Upon doing so, it tears a whole through floor after floor to the topside of the ship’s deck. No more secrets as Sanders must decide how best to contain the situation and the hole in the hull that is quickly flooding his engine room while O’Brien and his crew of nameless sailors attempt to secure the bulkhead. While O’Brien fights the incoming water below decks, Stack realizes that when the boiler below decks blew, it ripped through his and Malone’s quarters. After rescuing his daughter from plunging into the bottomless hole that has appeared in their room, he now turns to help Malone who has become pinned under an enormous sheet of metal that has come to rest against her and a bulkhead. Panic begins to grip Stack when he cannot get her out with the help of a couple crewman. Manpower isn’t enough. He’ll need a torch in order to get her out and heads downward to the depths of the engine room for the proper tools before they are lost under water. It’s here that he’ll find a friend in Strode who will lend a firm hand and plenty of muscle in helping Stack attempt the impossible. Finally relenting, Sanders realizes that all is lost and orders the ship abandoned. Panic ensues which does little for Stack who refuses to leave his wife to a watery grave though she has resigned herself to her fate and implores Stack to take their daughter and save themselves. Even O’Brien and Strode believe they only have moments to flee the ship before they too will be lost with Malone below the waves. 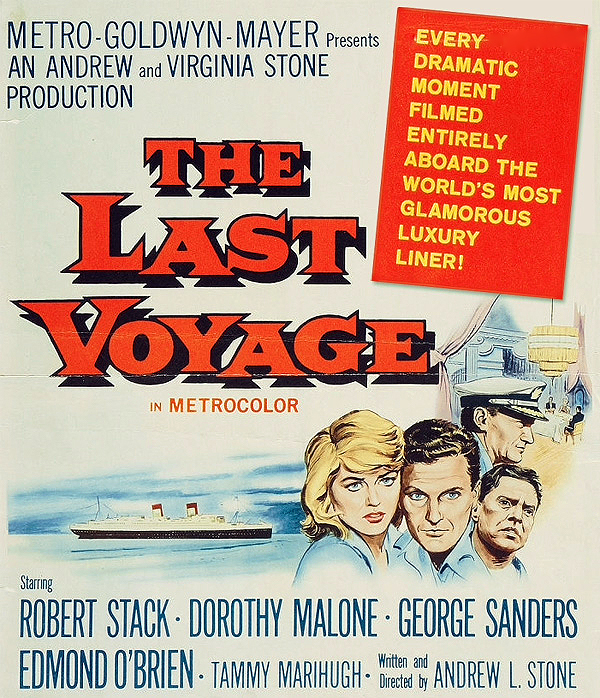 What makes The Last Voyage work is the use of a real ship and Oscar Nominated special effects showing it’s demise coupled with Stack at it’s center as a man striving to save his beloved wife. Stack in the lead role is surrounded by three previous Oscar winners. Sanders as the Captain is notably arrogant until it’s too late, O’Brien as the grizzled, quick tempered engineer has to be considered a bonus to most any film and Malone as the wife who faces her own mortality. I have at times picked on Malone here for the many roles she played where she does nothing but plot and lust after the leading cowboy. 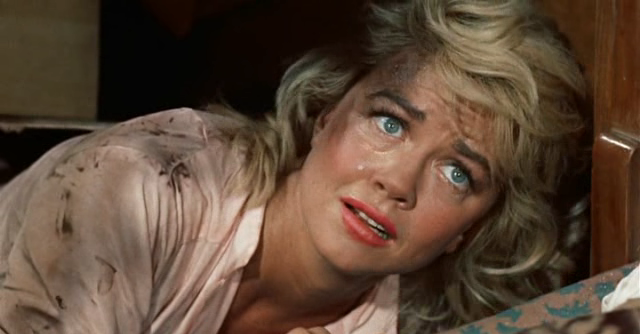 While this role could be considered a bit melodramatic by today’s standards, I felt she did just fine as a woman condemned by misfortune and bad timing. She and Stack had already co-starred together in 57’s The Tarnished Angels and her Oscar winning role for 56’s Written On the Wind. Malone would even appear in an episode of Stack’s iconic TV series, The Untouchables. She retired from the screen following her appearance in 1992’s Basic Instinct. This also proved a good role with plenty of screen time for the muscular Strode. 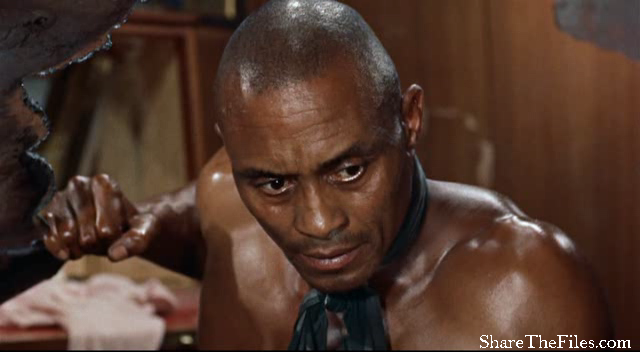 He’s shirtless for the entire film and while not as memorable as his appearance as Draba in Spartacus, 1960 proved a big year for the actor with these two films and the title role of John Ford’s Sergeant Rutledge. Aside from a few matte shots that look to be just that, the watery effects and explosions used here are wonderfully created on an actual ocean liner that was in fact headed to the scrap yard. They’re creative and the camerawork from writer – director, Andrew L. Stone is above par with a notable long shot of Stack and company running along the deck topside while the ocean waters begin pouring over the railings. Released by MGM, this is actually available through the Warner Archive line should you wish to add it to your growing library of titles. I think it’s cool that they shot on a real ocean liner; did it appear they were docked throughout the film, or at times were they actually at sea? That’s what I love about WWII films from the 1950s and 1960s…their use of REAL aircraft from the 1940s, and actual ‘planes in the air’ aerial sequences. Like you said, no CGI! Why have I never seen this! It sounds quite entertaining and I’m pleased you made me aware of it. My mission for the day is accomplished. Have fun. The famed Liner Ile de France from the Andrea Doria disaster was used in this film. If you look at the bow you will see the name “papered over” rather crudely . A sad end to a remarkable ship and history. One of the famous Bronze Door Medallions from the Normandie that features this ship is now on the door of the church in Brooklyn with the other medallions. I posted a photo of them on Facebook on the French Ocean Liner Site. I had read which ship was used but did not know any of it’s history so thanks for sharing a bit of the knowledge behind it. Haven’t seen it in a while but always enjoyed it. As you say, the use of a real ship made it so much more real. Stack and Malone made a good team. Memories of the Titanic too. That they did. It’s hard not to separate the film from real life disasters and of course for me, The Poseidon Adventure which I usually name as my favorite disaster flick.